It’s that time of the year again! One of our favorite. 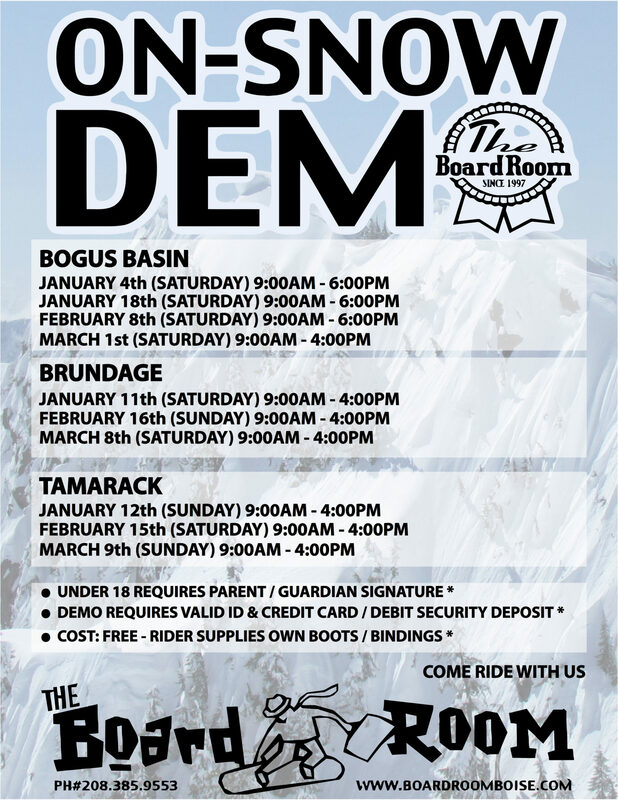 The Boardroom is proud to kick off it’s On-Snow Demos for 2014, beginning tomorrow at Bogus Basin in front of the Simplot lodge beginning at 9am. 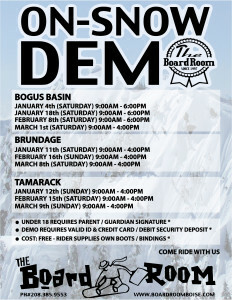 The Boardroom will host several On-Snow Demos throughout the Winter 1314 season at Bogus Basin, Brundage and Tamarack. Click the flyer for more details, dates and times. Cost for these demos is FREE. Those under the age of 18 wishing to Demo equipment will need a parent or guardian signature. Mark your calendars and be sure to come and check out the latest tech in both Snowboards and Bindings from your friends at The Boardroom. We’ll have FREE RedBull and candy on hand for all participants who demo equipment. Come Ride With Us!